Quote: “When we, God’s people, come into His presence with thanksgiving and praise, warfare is waged against our enemies.”—Darlene Zschech in Extravagant Worship. 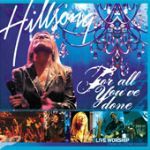 FYI: Each year since 1992, Hillsong Christian Church in Sydney, Australia—under the direction of Darlene Zschech—releases a live worship album of the newest, original songs written for the church. Each of those albums has achieved gold (some even platinum!) status in sales worldwide. The Bottom Line: Recorded in the Spring of 2004 at The Sydney Entertainment Centre with a 500-voice choir and a house packed with worshipers, For All You’ve Done captures again the unique talent and spirit of this church. This 2-CD set is a bold, celebrative cacophony of sound, ripe with lyrics that will infuse your life with praise and gratitude to God. There’s not a soul on earth that doesn’t need more of that. If live worship is your thing, let your fingers do the walking and hit the buy now button. Listen to samples or buy For All You've Done from Songs4Worship.com!